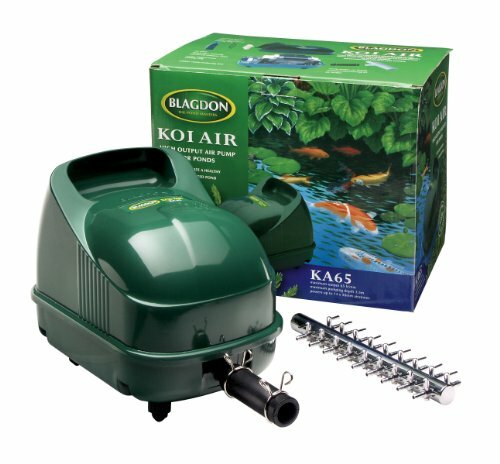 "Aquatica Plus UK ships Blagdon 65 Koi Air Pump from Amazon.co.uk. Amazon.co.uk has fast shipping in the UK and often free shipping on pond and aquarium supplies. Add to your basket now while supplies last to avoid delays." Koi Air 65 - 65 L/Min - Max Depth 350 cms - 60 watts - Max18 x 50mm air stones at 2 metres 18 way mutli outlet It is a widely recognised that good aeration is essential for good pond water conditions and healthy fish. Good earation stops pond water stagnation; fish dying from lack of oxygen; helps sick fish recover; improves water waste breakdown and aids filtration. Koi Air Pumps are a reliable way of supplying aeration to ponds and filters - its robust rubber diaphragm is durable and easy to replace. Koi Air Pumps are speciafically designed for use with ponds where the ability to pump several metres deep, with a number of airstones is important. The Koi Air Pump comes complete with a mutli airline outlet.